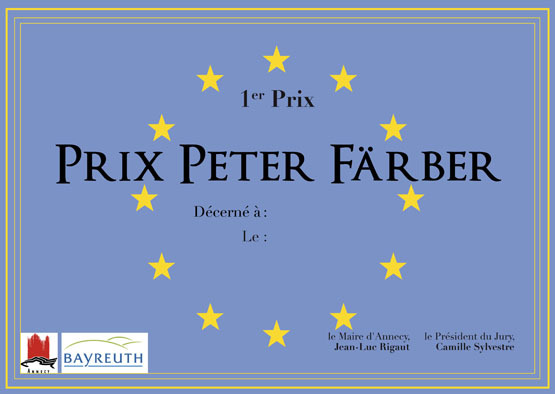 Peter Faber (deceased 2009) was one of the founding members of the Annecy-Bayreuth twinning. In his youth he was profoundly touched by the atrocities of the war and since his captivity in France he worked tirelessly to reconcile and foster friendships between France and Germany. As a French language teacher he devoted his life to openness and mutual discovery and promoting youth exchanges to facilitate this. In recognition for this commitment he was made an Honorary Citizen of the Town of Annecy and is one of the few to be appointed as a Knight of the National Order of the Legion of Honor. 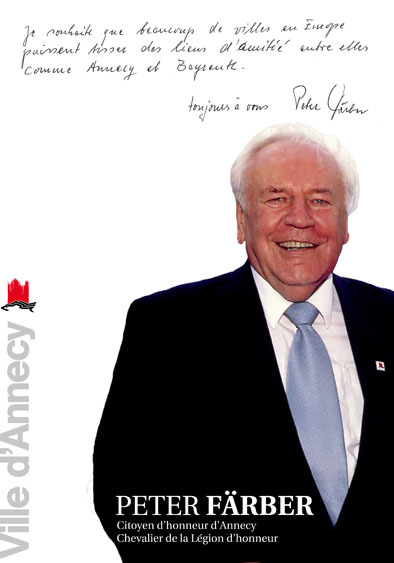 To perpetuate his memory, which remains a source of inspiration for twinning and for our youth, the Town of Annecy created a prize bearing his name. What is the Peter Faber prize ? This prize is awarded by the Town of Annecy, to an individual project based on a topic of interest to both twin towns (for example; German culture, aspects of the Annecy-Bayreuth relationship or on one or more specific aspects of the city of Bayreuth). create closer ties between institutions, associations, clubs and / or companies in both towns. As an example please read "Bons plans pour un séjour à Bayreuth" (Tips for a trip to Bayreuth) (pdf-4,9 Mo in French) written by Romain Quioc, the winner of the 2011 Peter Farber prize. As an example please read : Synergie des attentes et des idéologies politiques entre les Français et les Allemands (pdf-2,2 Mo in French) written by Gautier Boudinet, the winner of the 2012 Peter Farber prize. Be either from Annecy or studying in Annecy. Be between 18 and 30 years of age. Have a good working level of German, in order to conduct research. Have a draft of your project approved by the jury. Provide a curriculum vitae and a piece of identity. Submission documents are available from January and must be submitted by the end of March.